What is one of the most common questions we get asked at Inawisdom? So, as AI (Artificial Intelligence) and ML (Machine Learning) experts, we decided to host an event with our partners Amazon Web Services (AWS), to answer this very question. Our event was held at Amazon’s UK Headquarters at 1 Principal Place, Worship Street in London on Thursday 8th November 2018. 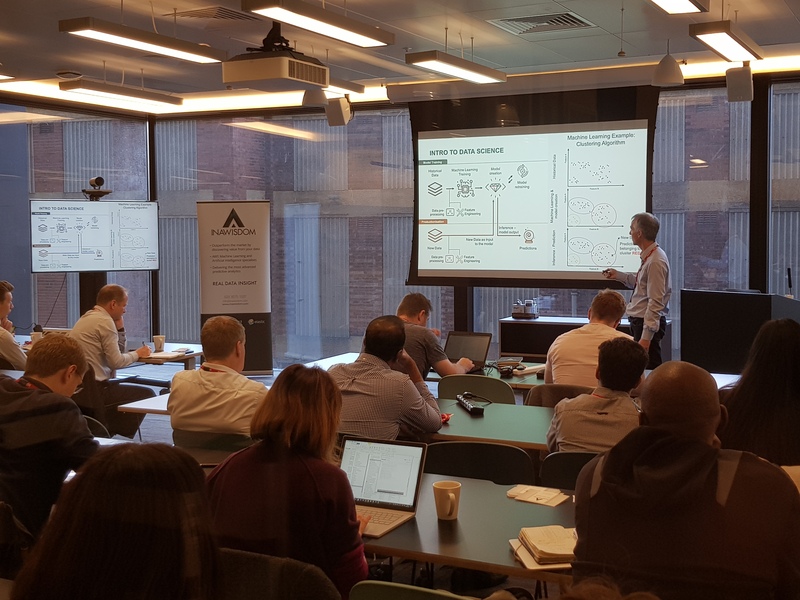 In addition to Inawisdom hosting the event, one of our key customers, Bjoern Reinke, Director of Smart Metering from Drax also had a session explaining how Inawisdom have helped Drax on their AI journey over the recent months. With a strong number of both business and technical leaders from multiple industries attending the event, it was a fantastic opportunity to demonstrate how Inawisdom are helping companies to achieve business differentiation by using AI across the UK. After initial introductions Dan White (Partner Solutions Architect Manager UK&I, AWS) started by explaining “Why AWS need Partners”. After covering the fundamentals of AI, Dan explained that from an individual point of view, effectively using Machine Learning is not simple at all. Which is why AWS and many other organisations seek the advice and expertise of specialist partners in that area. Neil Miles, Inawisdom CEO, followed Dan by providing an overview of how Inawisdom help our customers to benefit from fully utilising AI. From improving forecast accuracy to identifying anomalous activity, Inawisdom offer a fully customisable Machine Learning platform which allows customers to achieve these benefits. After introductions concluded, Bjoern Reinke from Drax stepped up to explain about Drax and why they looked at firstly using AI but secondly why they decided to use AWS as their cloud provider. Bjoern echoed something which we at Inawisdom regularly explain and that is that AWS is currently regarded as the market leader in cloud computing and it has been that way since 2010 when AWS was established. The continuous advances in AWS cloud technology and services and their considerable investment in AI/ML, only continue to reinforce this point. Bjoern explained that during a 4-week engagement with Inawisdom, Drax were able to identify anomalies within their data sets. This resulted in Drax being able to analyse the anomalies and solve them significantly quicker than their existing method, where it could have taken a period of six months to identify and act upon the same information. Beginning with Artificial Intelligence and delving into Machine Learning and finally Deep Learning, Robin educated the audience by explaining the extensive opportunities AI can bring to businesses which affect both the top and bottom line. Following on from this Robin then began to explain ‘AI in Action’ from a much more technical standpoint. After firing up the AWS console and accessing Amazon SageMaker, he then used openly available example data from a Portuguese bank to train the ML models, which investigated customer conversion rates. Within 30 minutes Robin had demonstrated how to import data, train it and produced a feature importance table where the end user could see what inputs had the highest importance on conversion rates. Neil wrapped up the panel session by asking “What is your one key takeaway or piece of advice for ‘Getting Started in AI?’” Robin led by reinforcing his earlier point, that to see the benefits from AI that businesses must continue to strive for continuous improvement. Dan White, AWS expressed that “companies can take advantage of expert AWS partners to help them integrate and accelerate the services they require. AWS are also able to help organisations with getting started in the form of credits and partner programmes.” To find out more information about Inawisdom’s ML specialism please see our AWS Solution Space offering. Neil finished off by emphasising that companies should ‘Discover first & invest later’. The feedback from the event from both attendees and AWS was fantastic. We are in the process of following up with everyone we spoke to at the event, and due to its success we look forward to hosting more of these events in 2019.